Sadly many organisations both public and private have an ongoing challenge to protect their valuable equipment. This is not always due to theft, assets can all to easily be misplaced, damaged or incorrectly registered. Losing assets is easy, but so is protecting them with the right asset management. Keeping track of your organisation's assets will give you peace of mind and your employees some accountability. By simply putting asset labels on your equipment you can quickly create an accurate record of your assets and protect them from being lost. Asset labels come in all sizes, shapes and material types so depending on your requirements you can always find the right asset labelling solution for you. Vinyl Labels - suitable for printing asset labels with images such as a barcode and solid coloured text. Metalized Polyester Labels - suits most asset label requirements and will conform to most surfaces. 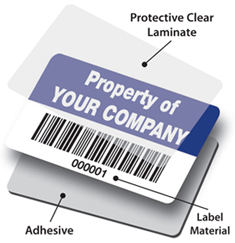 Ultra Destructible Tamper Evident Labels - theft deterrent asset labels that also discourage unauthorised asset transfers. Aluminium Foil Labels - the most universal solution to suit most asset label requirements. An alternative to asset labelling is asset security marking this permanent visual security marking for asset identification is recommended by the Police and insurance companies. Conforms to Home Office Guidelines by using your name and postcode as a way of identifying your property - this will also help recovery in case of theft. Dantech has produced millions of stencils over the years and supplied to local Authorities, NHS, educational establishments - even the police as well as thousands of companies. Visit www.idmark.com for more information.